It's so hard to believe that this is the last post of 2018! It's been such a fun year, full of surprises and excitement and new beginnings all around. In 2018, I shared 54 posts with y'all and took a lot of time off because of pregnancy and then having a new little one around the house. 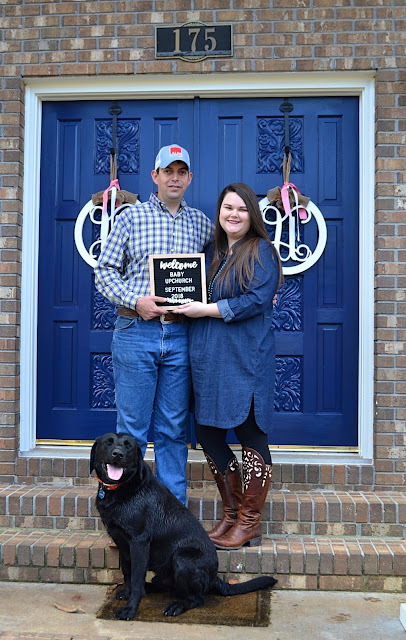 Let's take a look at some of my favorite personal moments & then the top ten posts that I shared on Southern & Style for 2018. Last Winter was one for the books when it came to weather! We had a big snow in December of 2017 and then another smaller (but still lots of!) snow in the first few weeks of January '18. I'm a snow girl & love, love, love it even though it does make farm life a little more difficult. It was a beautiful way to kick off a big year. In January, my oldest sister & I went spent a weekend in Atlanta going to see our favorite podcast's live show-My Favorite Murder! We had a blast and it's definitely something I would love to do again in 2019! 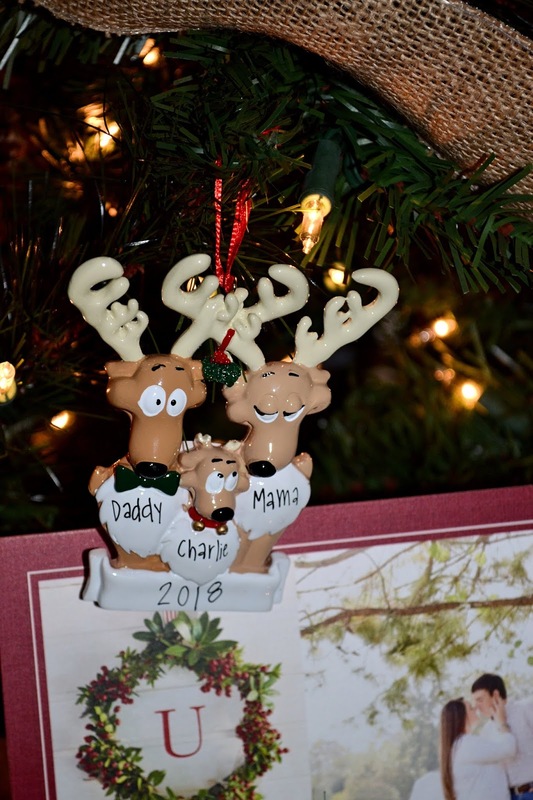 One of the biggest moment's of 2018 was revealing both on my personal social media & on the blog that we were expecting Charlie! 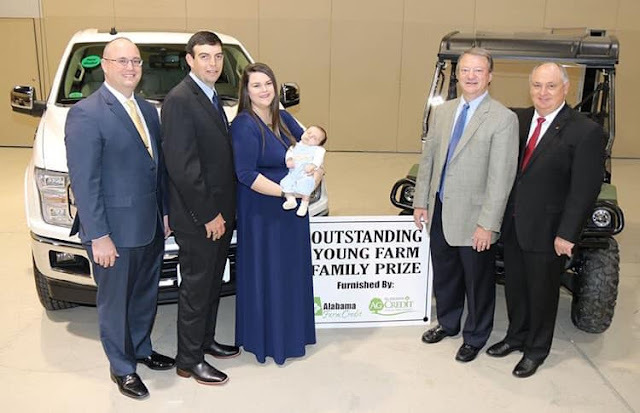 Another fun moment was from February, where we attended our state's Young Farmer's conference and were chosen as one of the top three finalists for Outstanding Young Farm Family. In April, we had our gender reveal party-so fun! 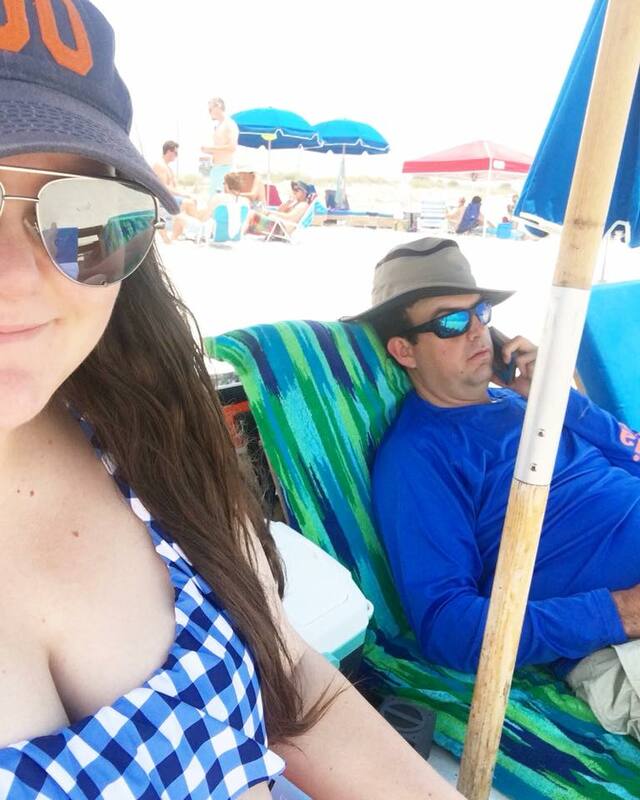 In May, we took a quick trip to Panama City/the 30A area of Florida for a "baby-moon" and a three-year anniversary celebration. It was just what we needed & we had the best time just relaxing and having a good time on our last vacay as a kid-less couple! We already cannot wait to take Charlie to our favorite vacation spots. In June, we spent a lot of time with our niece and nephew taking them to do some fun things. One of these was a quick trip to a waterfall and hiking trail-it was the first time we had ever taken Forrest as well so it was so fun! Another thing to add to the list of things we cannot wait to take Charlie to do one day. 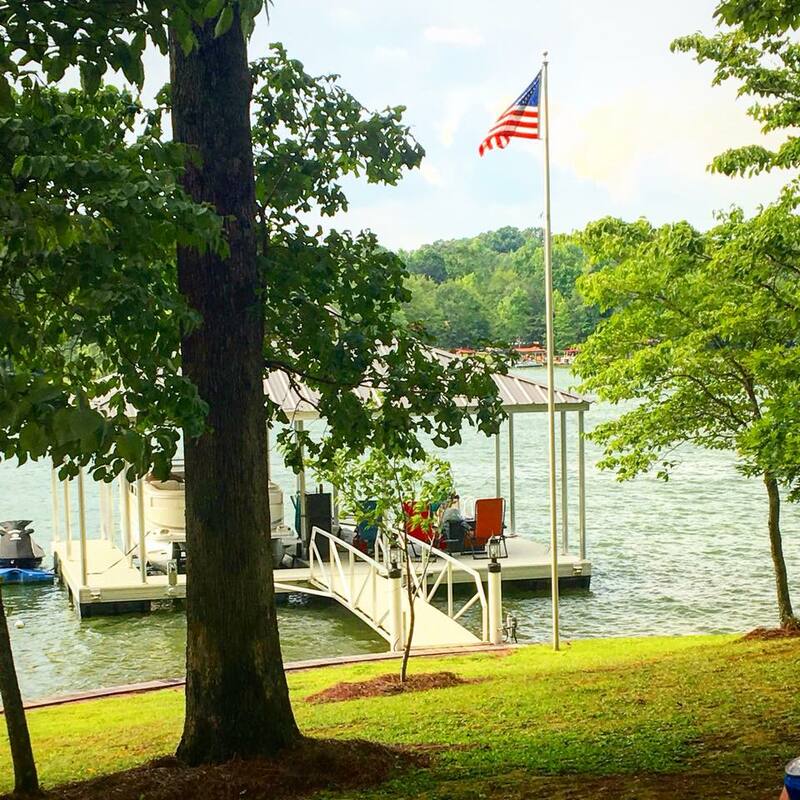 July was spent on the lake with some of our friends, we always have the best time! I know I just keep repeating myself & I'm sorry for that, but I just love that on the next Fourth, we'll have Charlie down by the water in a little smocked outfit to watch fireworks and enjoy a boat ride. 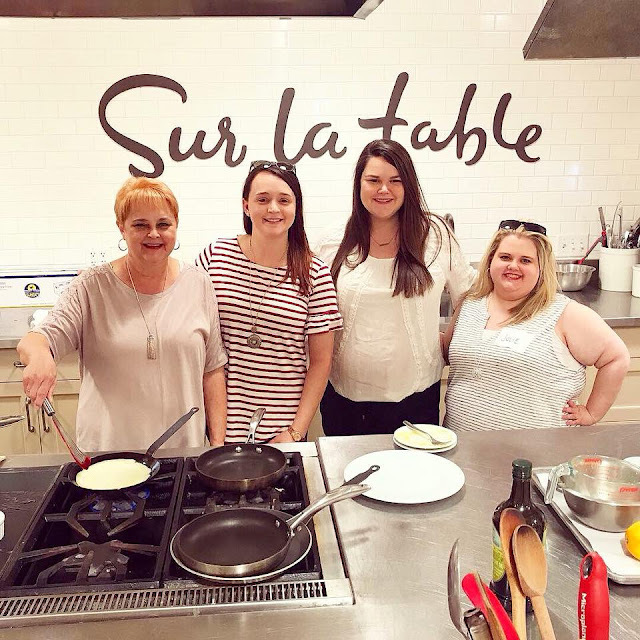 For our June birthdays (my middle sister, my mom, and I) we were given a cooking class at Sur La Table by my oldest sister. We had done this once before and it was so fun & the orange crepes we made were so yummy! 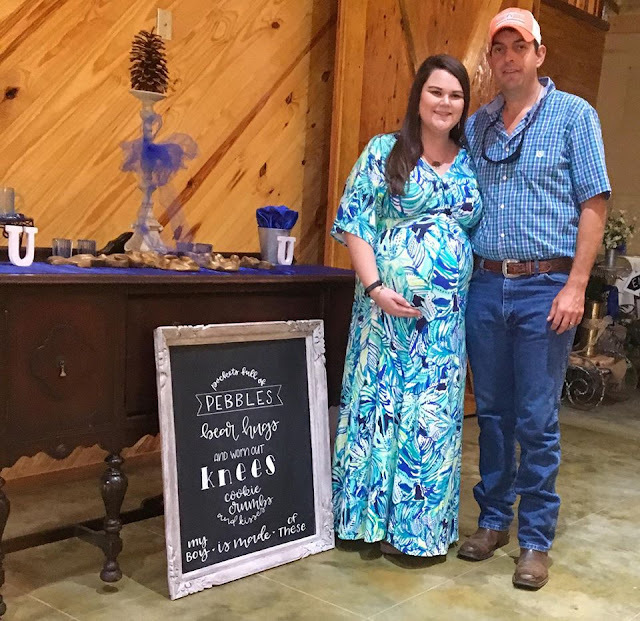 At the end of July, we had our first baby shower for our sweet boy & it was just perfect. Such an honor-truly. Being chosen as OYFF has led to a lot of fun things, like being asked to come speak at other counties. We got to meet one of our state representatives and it's always such a pleasure to take part in the political process and speak to our leaders. The end of August brought our first annual Cattlemen's rodeo. It was an amazing weekend & a huge success that Chris & I were both so proud to be a part of. It's such a small town thing, but I couldn't have enjoyed it more! On Charlie's due date, September 8th we went on our last little outing as a family of two, Chris' cousin Haley was married & it was such a beautiful day. 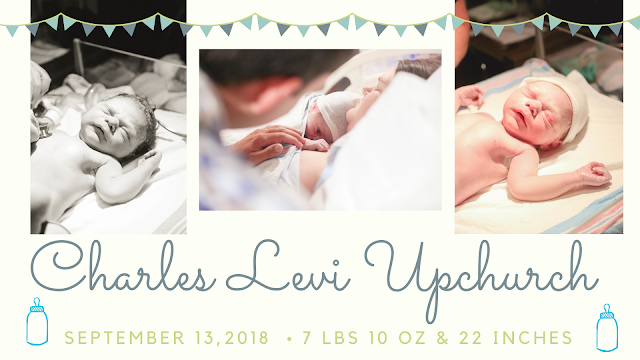 Then, the most exciting happening of all in 2018. . .
On September 13th, our sweet Charles Levi was born and we were 100% immediately in love with him. We have loved spending time with him and getting to him, seeing him change every single day has been the most fun. The best part is taking him to the farm though, we can't wait to raise him there. Another big moment of 2018 was dealing with our Forrest. 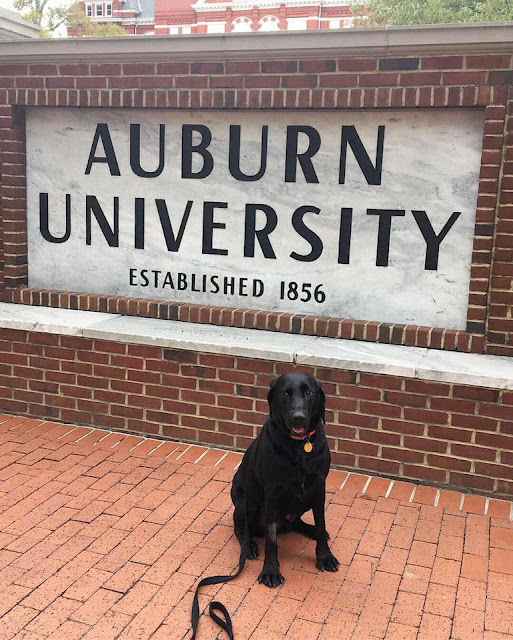 He suddenly couldn't walk up the stairs in our split level home, so after a month of rest and living solo downstairs we ended up taking him to Auburn (their vet school is world renowned) and having them do a thorough check. As it turns out, he was faking the injury-there was nothing preventing him from going upstairs except a little jealously. But what they did discover was a cancerous lump behind his knee. That was removed & he received a clean bill of health, so I guess we should be thankful for his fake injury! I had intended on him being a chicken, but neither costume worked out, so he went as a cowboy-the cutest one I ever did see! 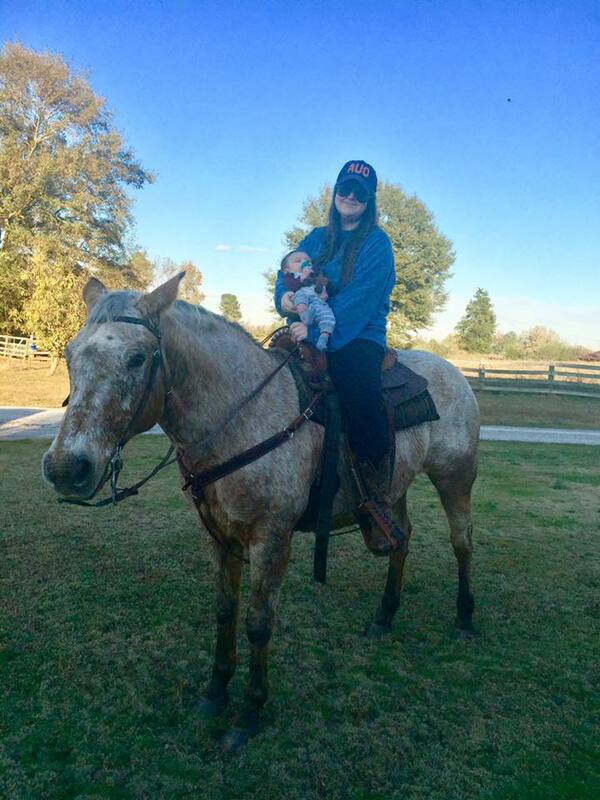 In November, we let Charlie "ride" a horse for his first time. Chris and I got out one of my horses, Willow, and we held Charlie so he could have his picture made. 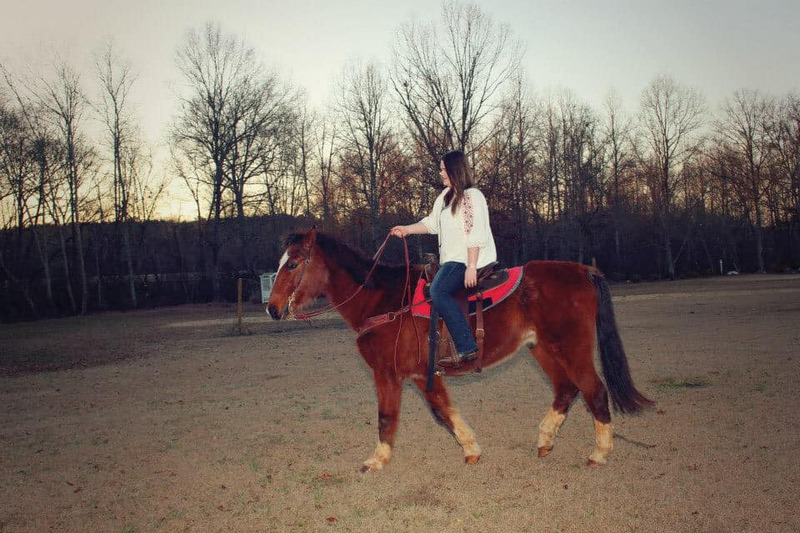 Now he can say he grew up on horseback, something I hope he grows to love. 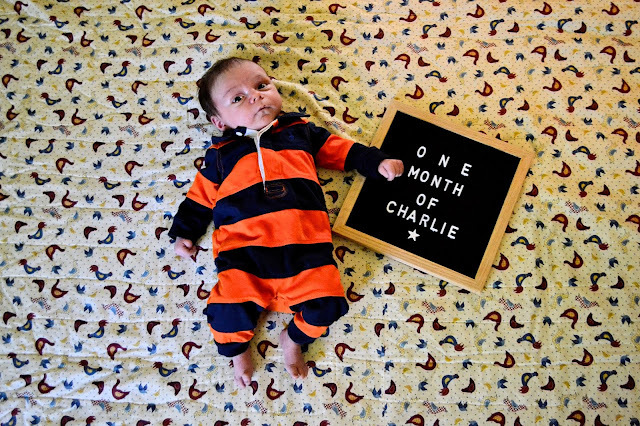 Charlie's firsts are just so fun to celebrate! December brought a close to one of the most fun year's of our lives to date-probably the best year, honestly. 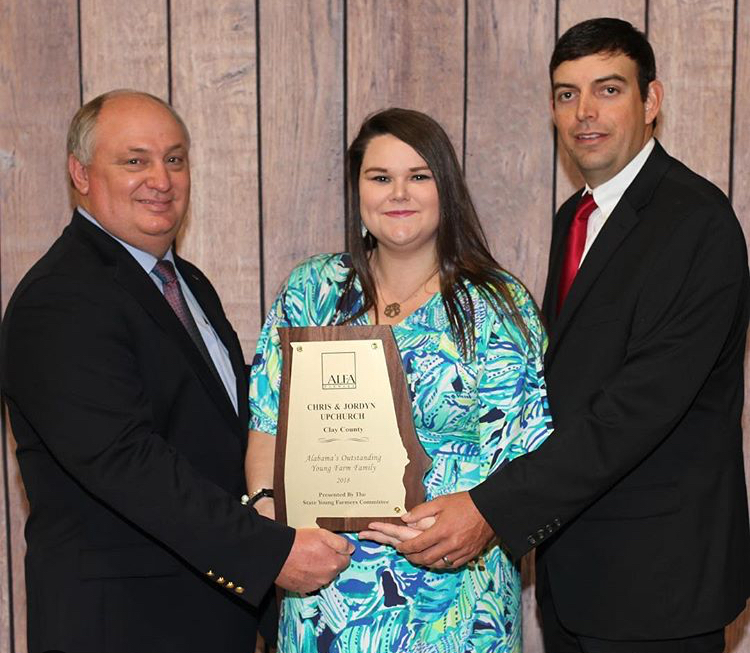 We attended the 2018 Alabama Farmer's Federation Annual Meeting to receive our prizes for being the Outstanding Young Farm Family and it was just such a special honor we will forever be grateful for. Even without the prizes, just being recognized for something that we try our hardest to be successful at is so special to us. One hard thing that happened in December of 2018 was losing our Wrangler. We bought him in June of 2014 and he was really the horse that helped me through losing my precious Paint (my horse that I had since I was a little girl). He gave me my confidence back, taught me so much about riding, and gave me so many good times with Christopher. 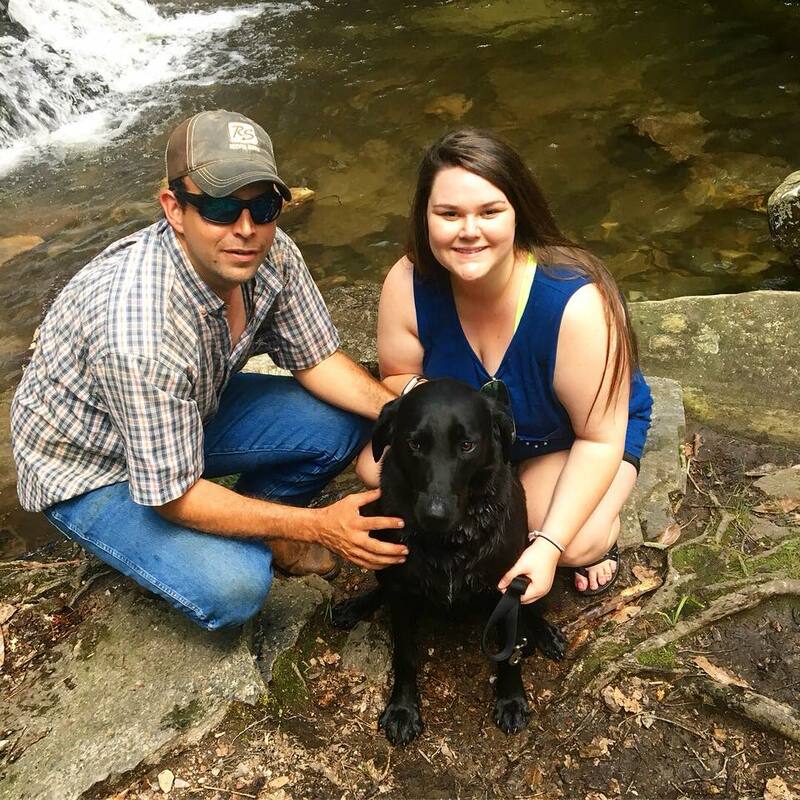 He was there when we got engaged and he was there for our engagement pictures. 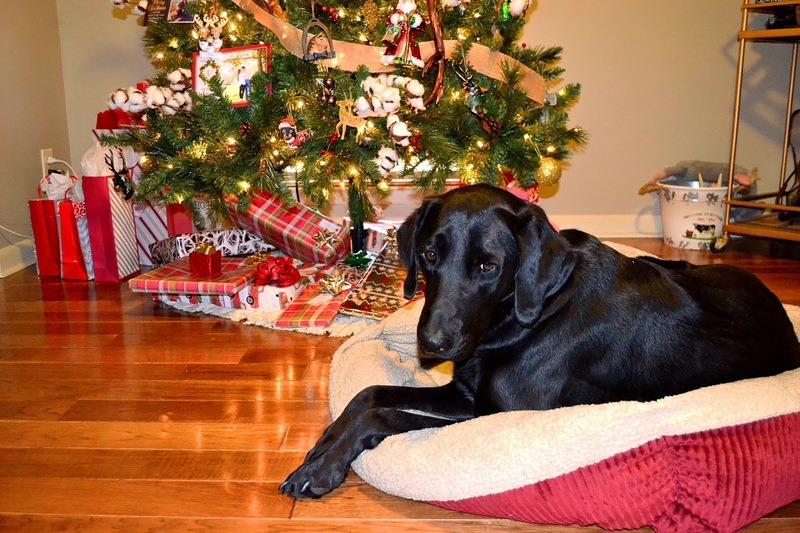 I will always hold a special place in my heart for my Wrangler boy. 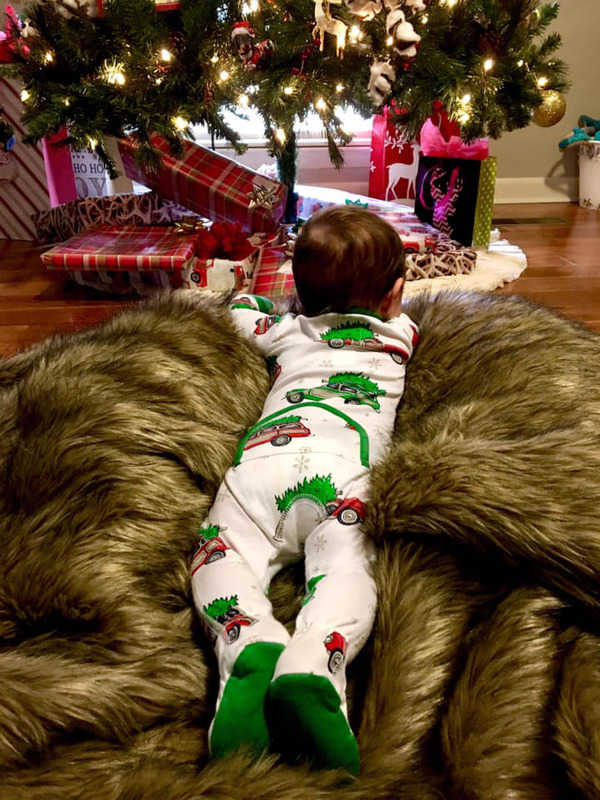 And closing out 2018 on a sweeter note, Charlie's first Christmas was just the best day ever. We woke up early and had a fun, big breakfast with both my parents (and my middle sister) and Chris' parents. Then we had a short time during the day where the four of us (Chris, Charlie, Forrest, and I) just hung out and enjoyed each other-then that evening Chris' family and my family came back and we had beef ribs fresh of the smoker for dinner. It was a fun-filled day and I hope the tradition will continue next year! 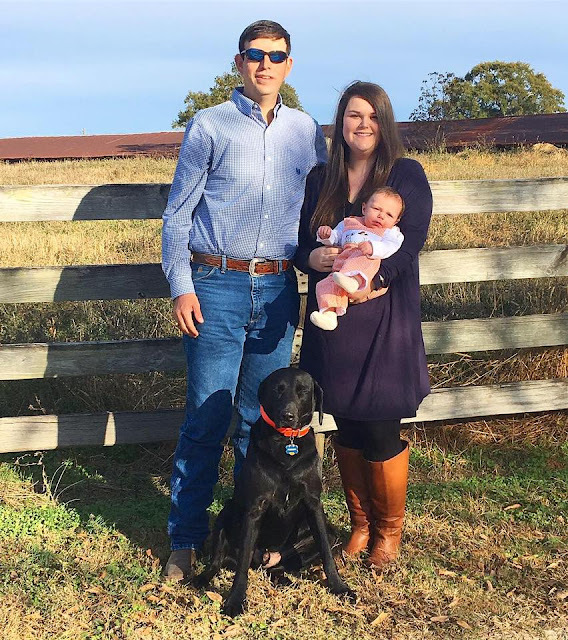 2018 had some hard, trying times, but it also was the best year both as a family and professionally on our farm. We truly hope that life will just get sweeter and sweeter now as the years go by. And now for 2018's top ten posts! 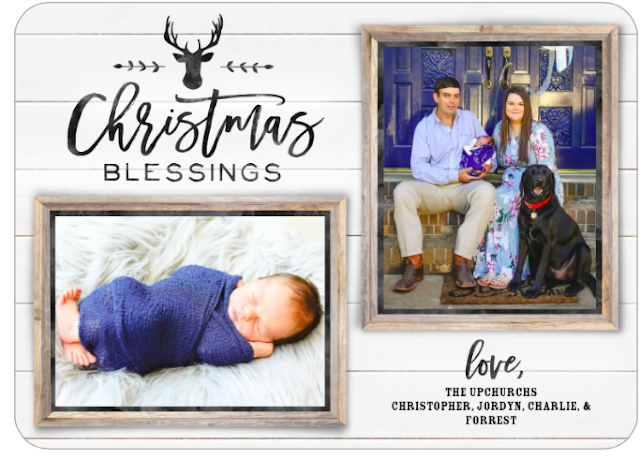 In this post, just a few days after Charlie's birth, I shared his birth announcement on the blog and social media. 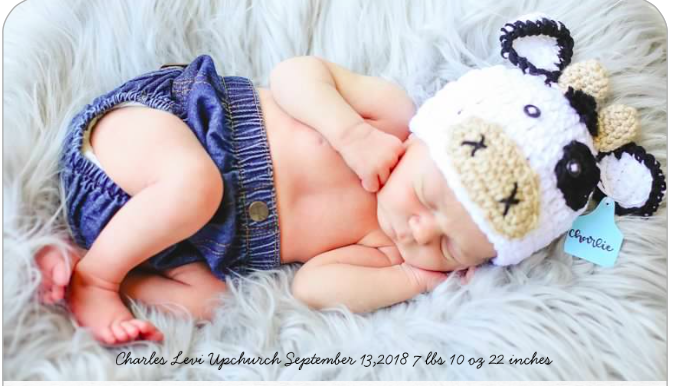 This was a short little post, but one that I was most excited to put out because I wanted everyone to know of his arrival! This was such an exciting post to share on the blog because we had been keeping it from social media for a few weeks by then! 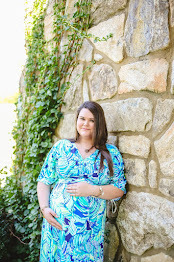 I answered some fun questions & shared lots of cute pregnancy reveal pictures in this post. Y'all, this post is just the best & I'm so glad that I did this yearly roundup so I had a good reason to go back and re-read it. Reliving those moments through my post is one of the reasons I started this blog! This post shares all the little details of Charlie's birth & one that I will forever go back and re-read. 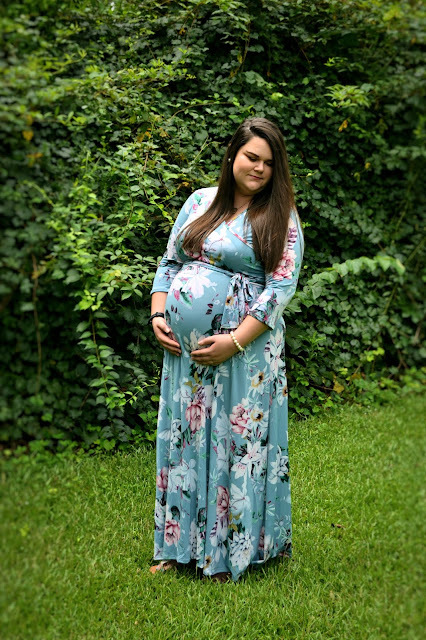 Out of all the things I wore while I was pregnant, this maxi was one of my favorites! It's from the website Pink Blush, which also sells regular clothes for women as well as maternity and plus sizes. 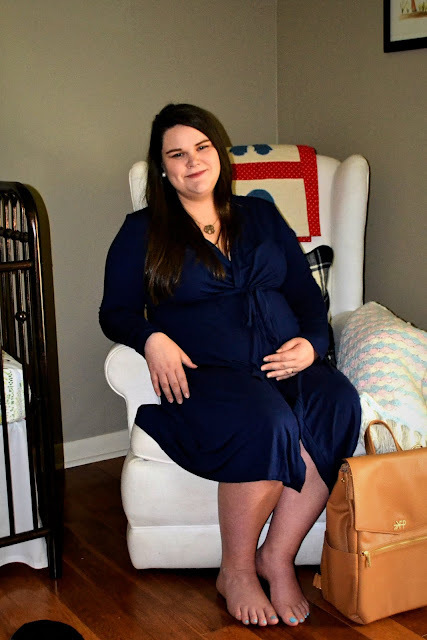 I only did two pregnancy update posts during my whole time carrying Charlie, mostly because I didn't think anyone else would find them interesting, haha! I talk a lot about my anxiety about bringing him into the world & honestly, that's totally a real thing. If you're expecting a baby or thinking about having a baby in the future, know that it's fine to worry! But also know that once he gets here, things have a way of working themselves out and that you'll get through whatever comes your way. I love, love, love that y'all enjoy my home tours! 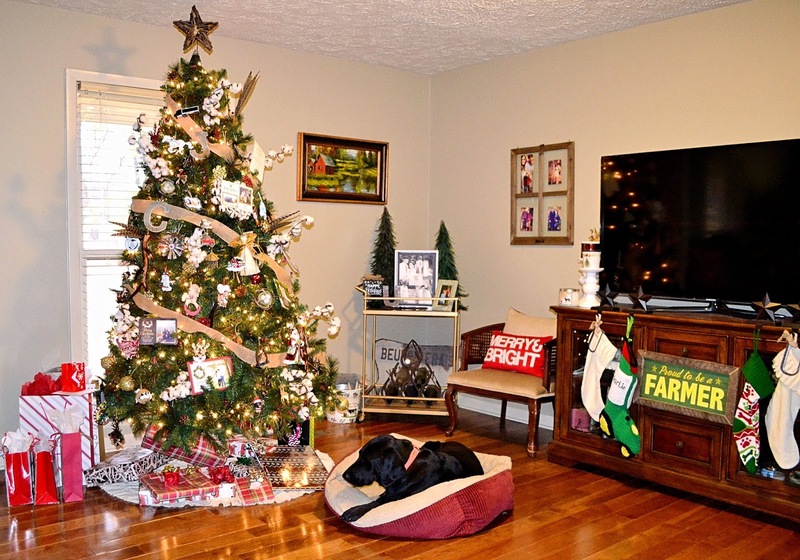 I didn't decorate for Fall so there was no home tour on that front this year, but y'all truly enjoyed this years Christmas decor. 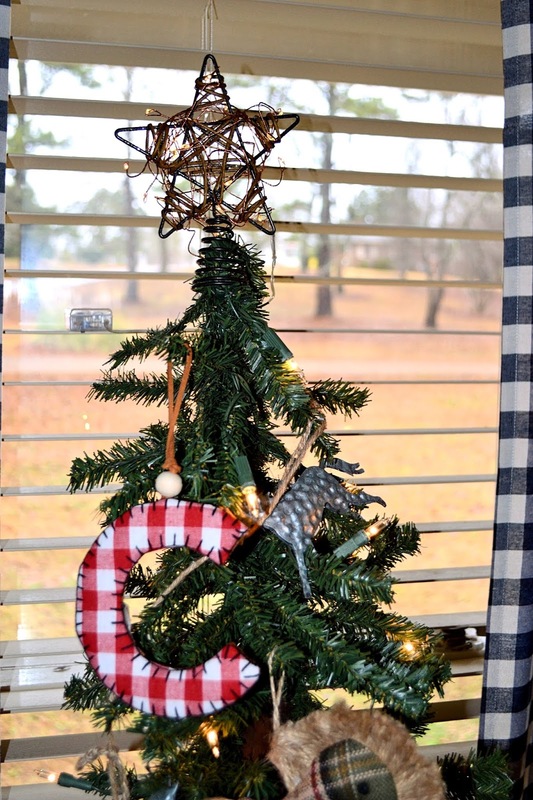 I kept it really simple and easily attainable (I think), and I also love the addition of Charlie's little tree. 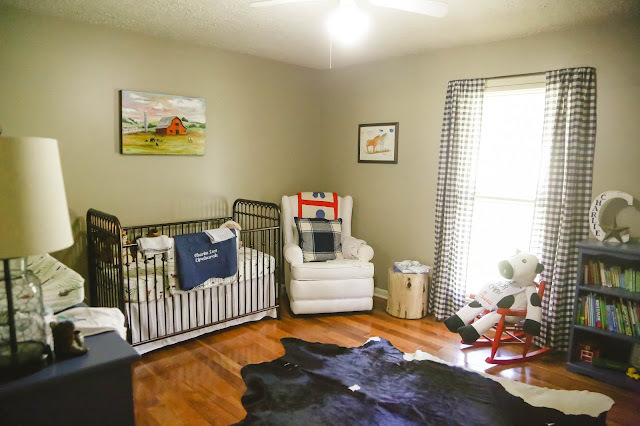 Since we found out we were expecting a little boy, I had this room envisioned in my mind. It took a lot of searching & hunting to make it come together (on a budget!) but it did and we love spending time in there. Charlie and Forrest love to play on his cowhide rug, I love to rock and read to him in his chair, and he's just recently started napping in his crib during the day-it's just a happy place. I was so, so antsy waiting on Charlie's arrival that I did each and every one of these things...some of them I did more than once! Waiting on your sweet baby to be born is such a unique time in your life, but one that should be cherished. I love looking back on how I was at that time in my life, now that he's here. 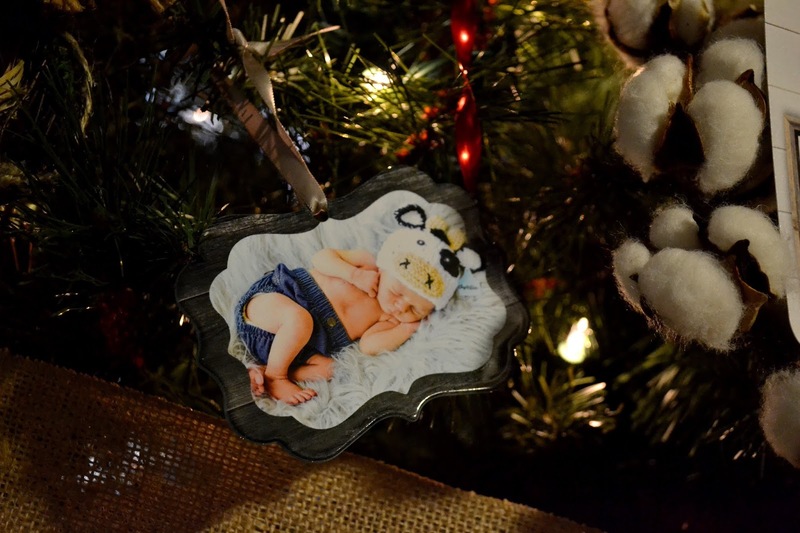 I have always enjoyed reading other "mom-bloggers" monthly update posts of their babies. It's so interesting to see how they grow! 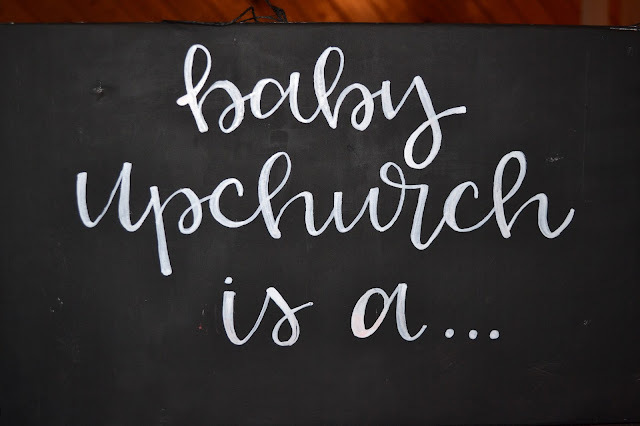 Baby Upchurch is a. . . This was so fun, y'all! Love, love, love this style post I shared from over the summer & I love that y'all enjoyed reading it! 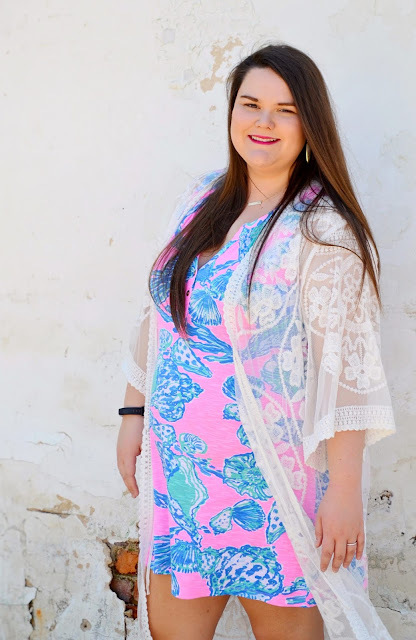 Lilly is my favorite designer and this dress is one of the most simple that I own-but the beauty of it is that it's so easy for tossing on and dressing up or down. In all serious-ness, I wish each and every one of you the happiest new year yet! Thank you from the bottom of my heart for visiting my little corner of the internet and choosing to welcome me into your home, if only for a little while. 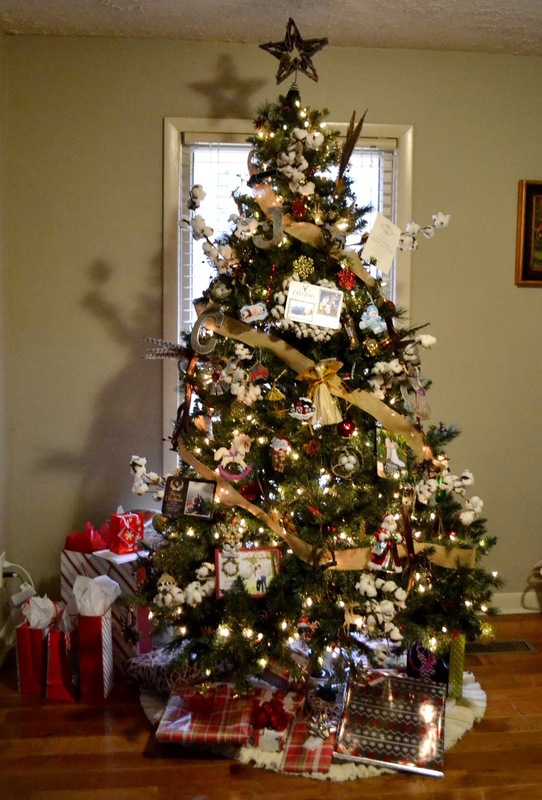 I hope 2019 finds you back here to visit this little blog of mine! 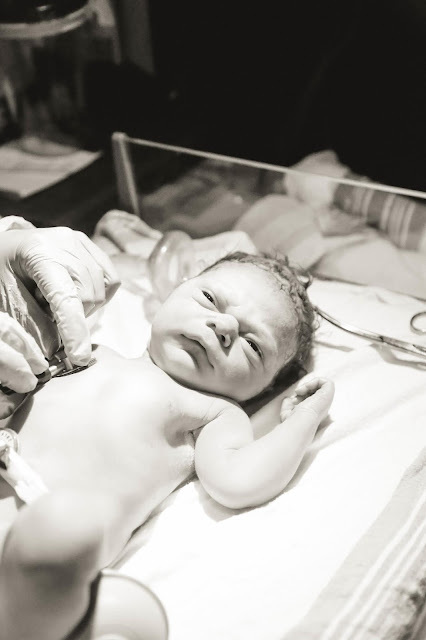 I'm sorry this post is going up late on Saturday instead of in the mornings-but if you've ever had a baby, you probably understand how difficult it was to find time to take these pictures, much less edit them, create the text for this post, add the links, and publish it! But I couldn't let Christmas come and go without sharing our third Christmas in this home & our first with Charlie. This will be a special holiday, indeed. 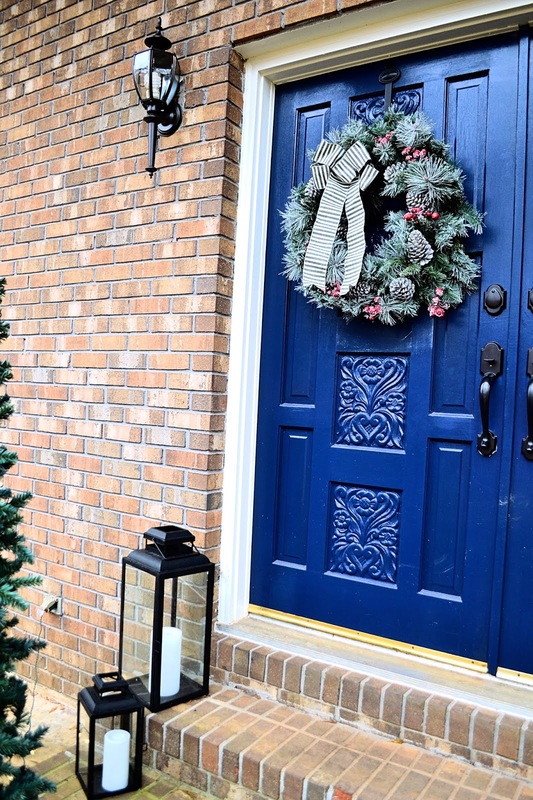 When you come into our home, you're welcomed by our columns in the color Roman Column by Sherwin Williams & our door in the color Salty Dog. 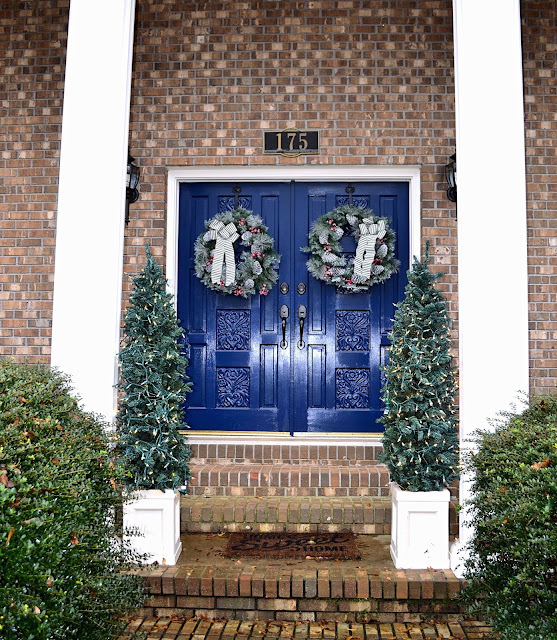 I love the bright cobalt blue! Our wreaths are from Home Depot's Martha Stewart line, but you could recreate the look yourself by adding a ticking stripe ribbon to your current Christmas wreath! My lanterns are something I've wanted for our porch for a long time, but lanterns are expensive, y'all. So I hunted them down from Target after the summer items went on sale & found all of the lanterns and the pre-lit candles on sale for between 50-75% off. These are similar to the large, and the small lanterns at a great price. 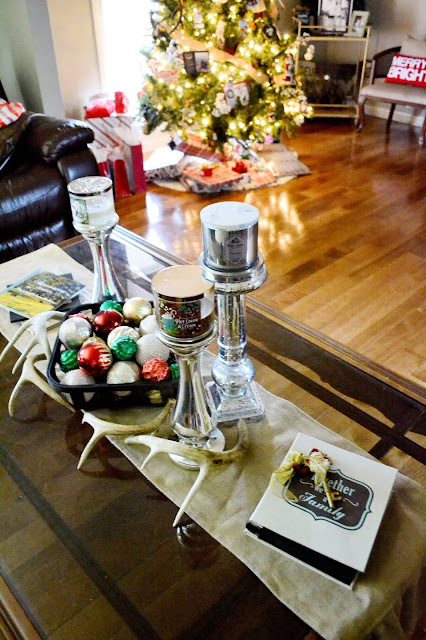 These candles are an awesome price point even when they aren't on sale, I used the 3"X6" in both sizes of my lanterns. 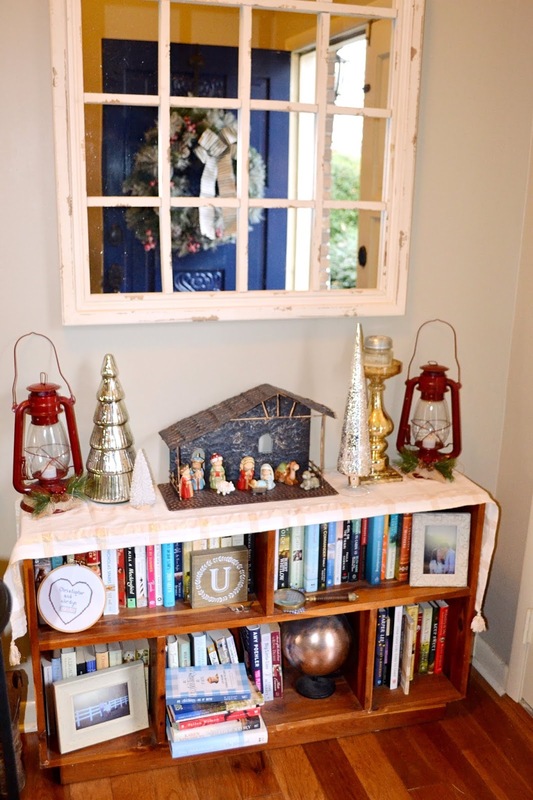 I love this little entryway so much, y'all. The bookshelf is one that my Daddy made in high school and it's one of my favorite pieces of furniture that I own. 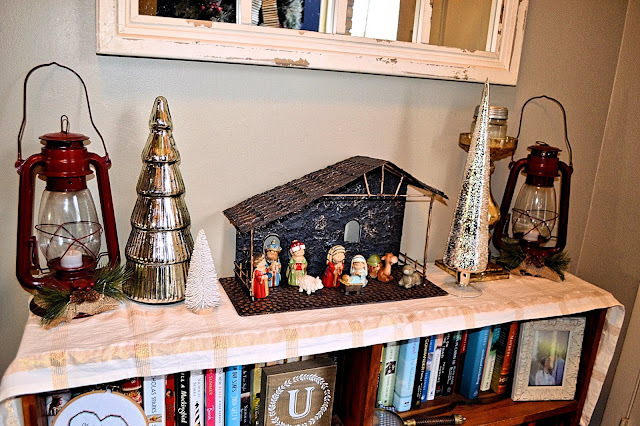 I topped it with a table runner, red lanterns, miscellaneous mercury glass items, and my nativity set which is all form Hobby Lobby. The mirror is from Kirklands and I had been wanting it forever...it pays to wait until there is an awesome sale because I got it for around $40! 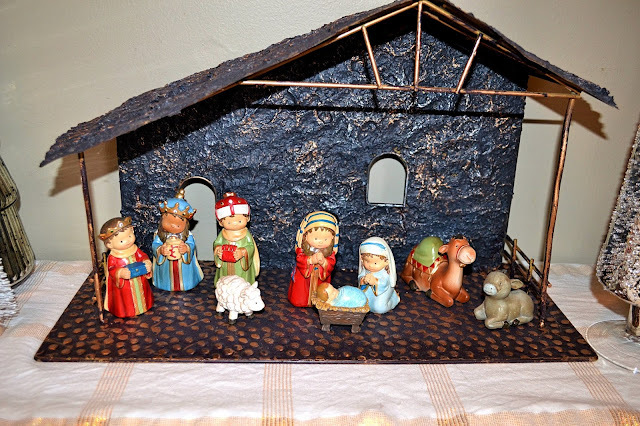 I've been searching for just the right nativity set to add to our home & this one is from Hobby Lobby. I love the sweet little animals and it's durable enough that in future years if Charlie were to get ahold of it they would be much less likely to break! Welcome to our living room! A wide shot of this room wouldn't be complete without Forrest, am I right? 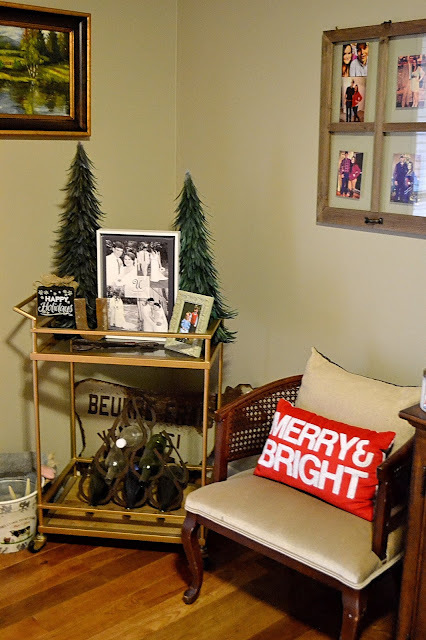 In years past, I had used my cedar chest to add extra decor but last year I decided to create extra seating there and it's been a great addition-we always need extra room when we have guests. 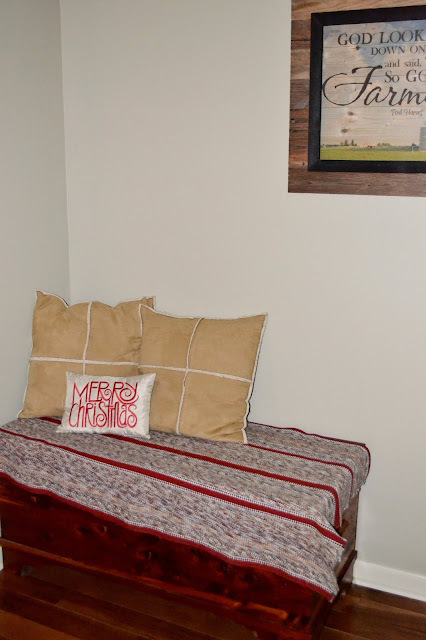 I just warmed it up with some pillows that Chris has had since before I even met him, a sweet decorative pillow, and a blanket that was my Dad's! We love reusing and keeping around sentimental items in our home. 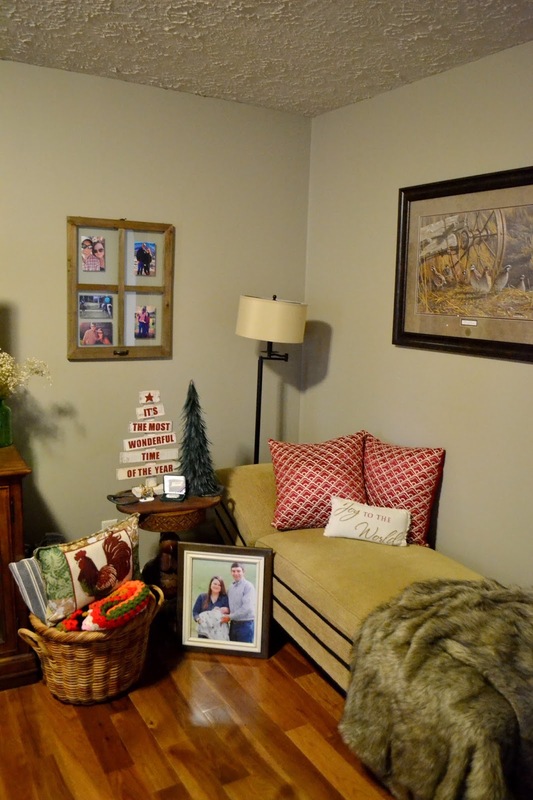 It may not be the most magazine worthy or something you'll re-pin a million times on Pinterest but it's cozy and we love it! 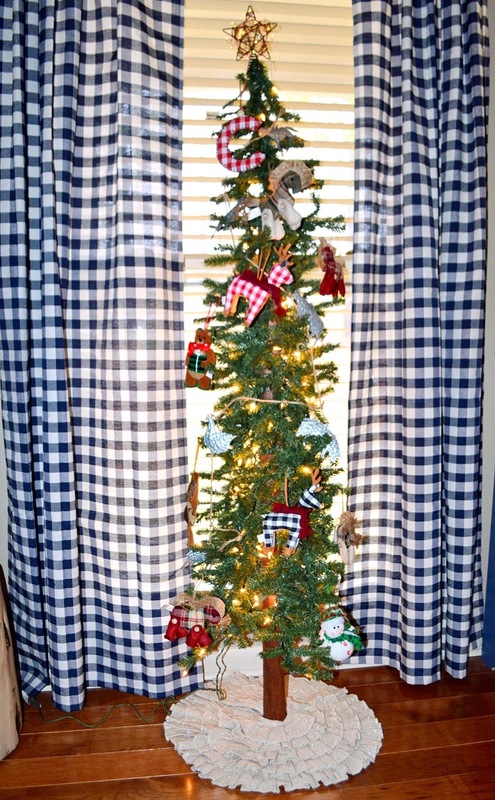 I honestly, really tried to keep the decor pretty minimal this year. I didn't put out nearly everything I had just because I wanted to keep life simple with Charlie around. 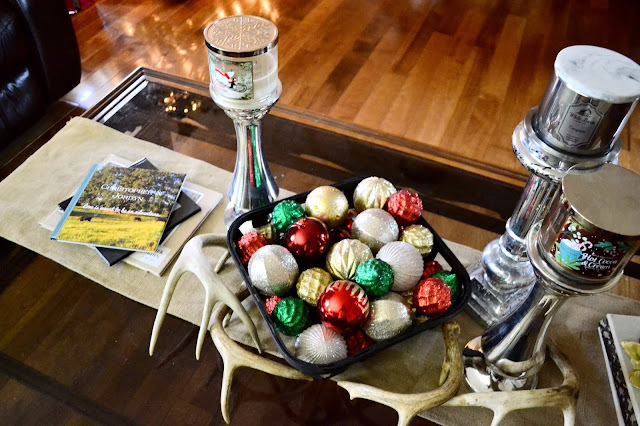 The burlap table runner is one that I use year-round throughout various areas of our home, and I always have our antler sheds on display-I love the rustic air they provide. The little tobacco basket and various candlesticks are all from Hobby Lobby and of course, my candles are Bath & Body Works. Currently I have out Twisted Peppermint, Evergreen, and Hot Cocoa and Cream. The balls are shatterproof from a set from Sam's Club, I always have my photo books out from Shutterfly (you can get a free one using that link! ), and my all-time favorite Christmas decoration is my Santa Key! This was given to me when I was a little girl, because we didn't have a chimney for Santa to come down. I can't wait to share the tradition of hanging it on the front door on Christmas Eve for Santa when Charlie is a little older. 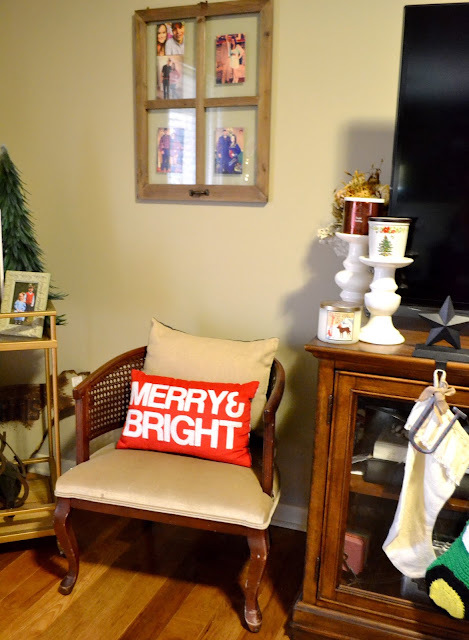 Y'all probably know (if you've been reading this blog for any length of time), that this is one of my favorite areas of my home to decorate. Since Charlie has been born, I've kept it really similar because it's just a lot of work to dig through all of my bins! But for Christmas I gave it an over-haul (with the help of my middle sis-shout out to Julie for helping me always!) and swapped out lots of things and I love the look. The top shelf will forever contain that plant (don't know what it's called, so if you do-leave me a comment!) because I love it so dang much. 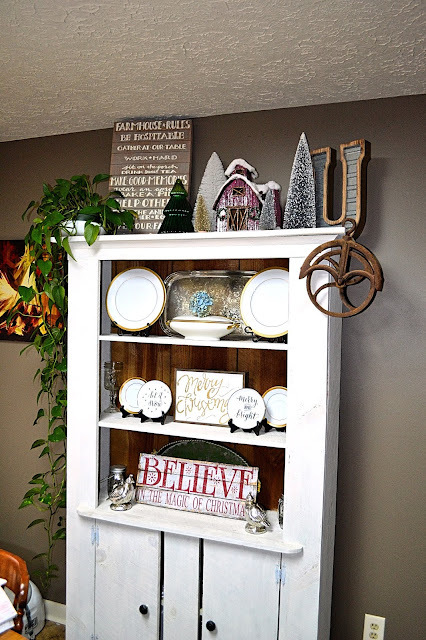 Then I added in my Farmhouse Rules sign, my big galvanized letter U, all of my various bottle brush trees, and my little red barn that I bought on clearance last year from Dillard's. My shelves are really simple, but classic and I love that. I featured a lot of my Grandma's china and a silver platter of hers. 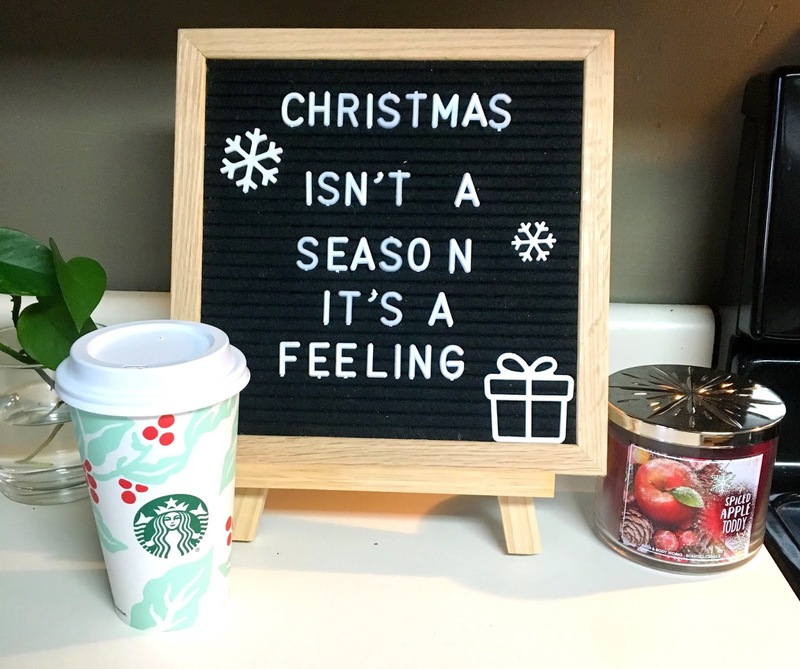 Then my two signs are from Kirkland's (they have the best Christmas decor). My little "Let it Snow" and "Merry and Bright" plates are from Target and my silver quail are from a local home decor store. 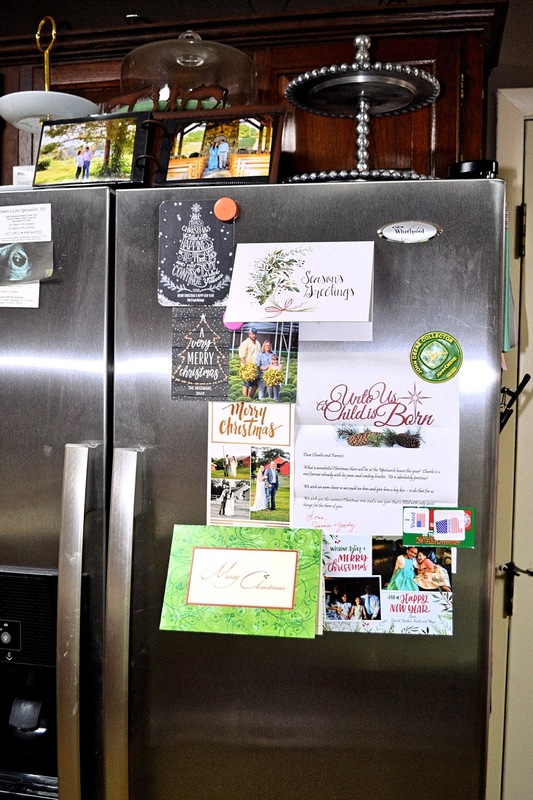 We started out displaying our Christmas cards on a metal sign we have hanging in our kitchen (using magnets), but they overflowed onto our fridge...but you know what-we don't mind because we love these seasonal greetings from our friends and family! 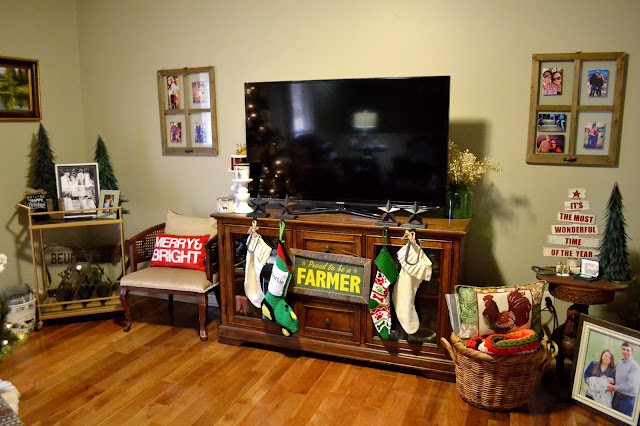 My decor in the kitchen is super minimal, because we use that space a lot and my poor husband can't stand it to be cluttered-I don't blame him! I use a similar pack of letters to get my snowflakes, presents, etc. 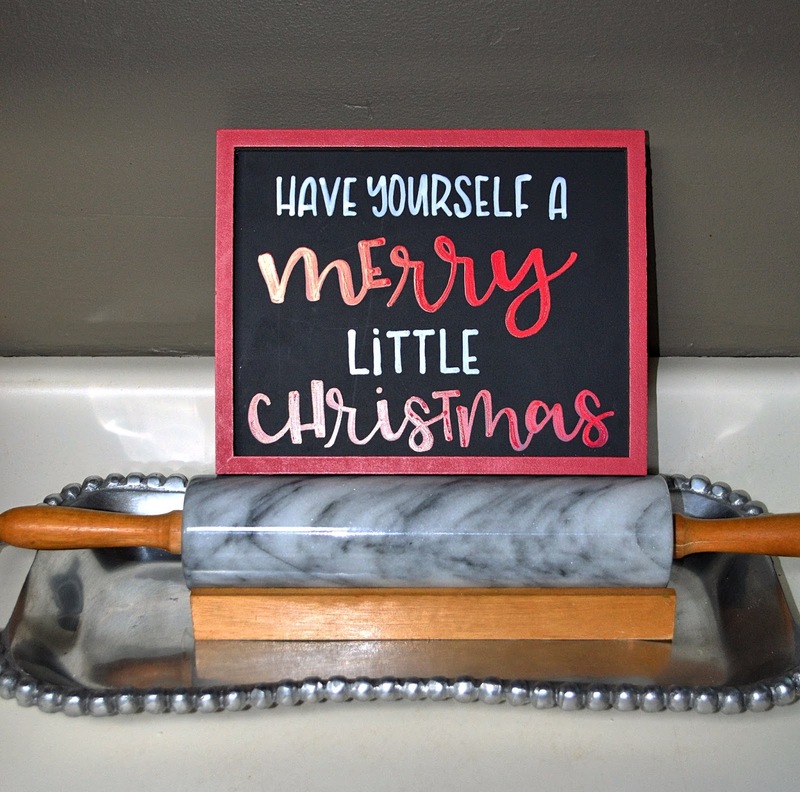 The "Have Yourself a Merry Little Christmas" sign was a hostess gift from my oldest sister. She has an Etsy shop where she does all sorts of neat hand lettering and I bet she could make you something, too! 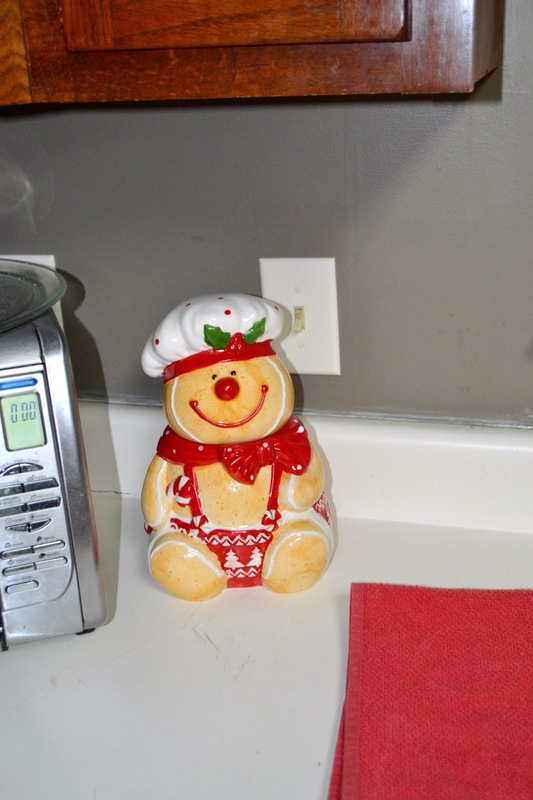 I also have this sweet little gingerbread cookie jar, a gift from one of my best friend's mom-she has loved us so well since we've brought Charlie home and we so appreciate her! Back to the living room. . . This little corner is tucked away beside our tree, but it's still cozy! I have my little bar cart (which is currently on sale!) topped with a canvas print of some of our wedding photos, feather Christmas trees that belonged to my grandmother, and a few other little miscellaneous decor items. I love my horseshoe wine bottle holder on the bottom-I've used it to collect a few pretty glass bottles and it's an awesome way to display them. The chair is antique from an estate sale & the pillow is old from Target, but they have a ton of cute ones that will be on clearance soon! The white candle holders are displaying some more seasonal candles, Frosted Cranberry from Bath & Body Works and the Spode candle that smells like a Christmas tree from a few years ago. This little corner of our living room is super cozy-I love it! 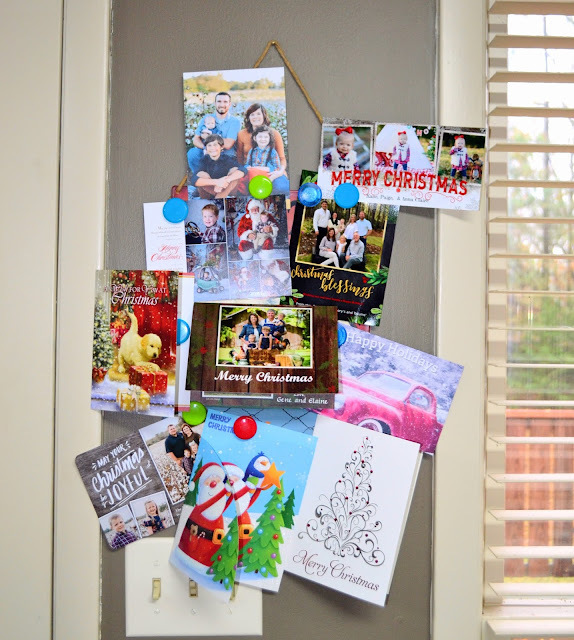 Our window pane frames are already affordable, but are also currently on sale...and the photos need to be changed out and updated! Maybe after Christmas. 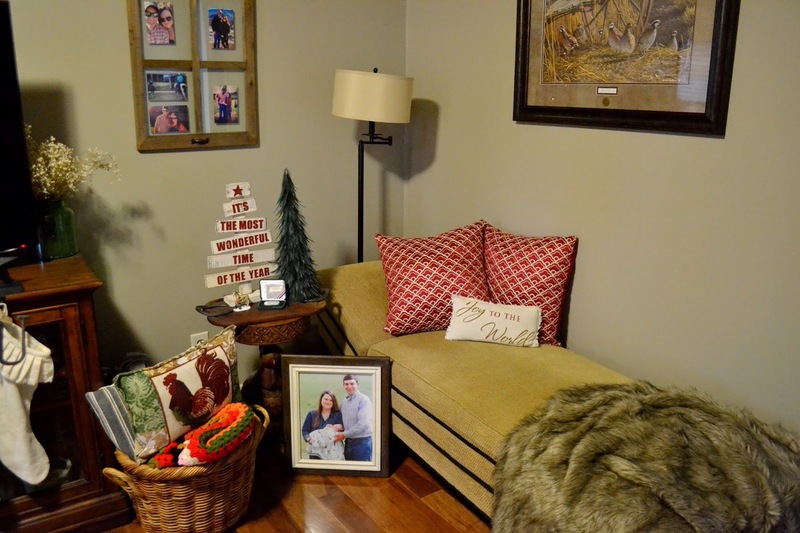 The print on the right is from the National Wild Turkey Federation, our fainting sofa is antique from an estate sale, and the little rooster table is also from an estate sale. I always like to have lots of pillow and blanket options during the winter months, so we keep this basket stocked as well as having my fur throw. Our stockings are now mismatched, but who cares-that's just part of having kids I think! Our cream burlap stockings match our Christmas tree skirt, but they're old so they're no longer available. 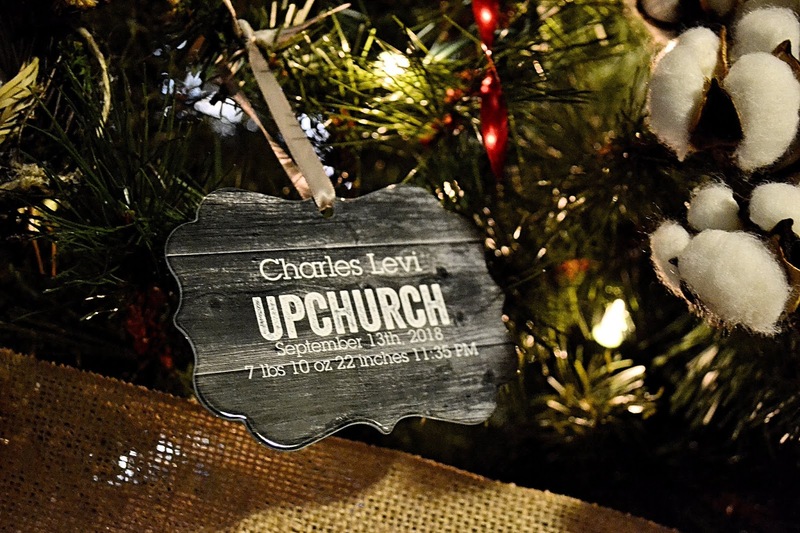 The metal "U" ornaments are from Mud Pie, they're plaid and available in tons of letters! 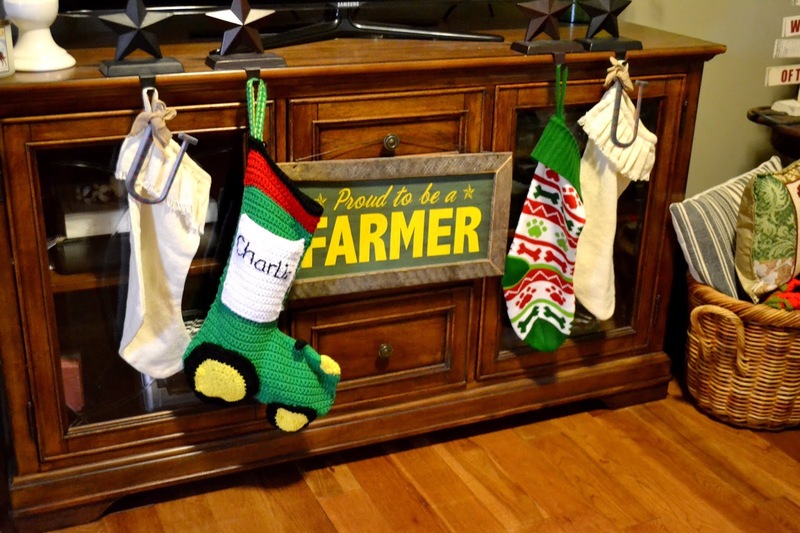 Charlie's tractor stocking was lovingly handmade by a lady from our church-such a sweet gift that we'll treasure forever and Forrest's stocking is in coordinating colors from Hobby Lobby. 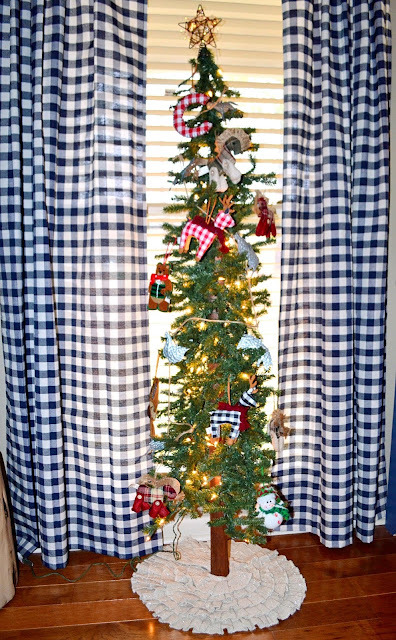 I just want it to be known that it's so difficult to take a picture of my tree when it's blocking all of the natural light! 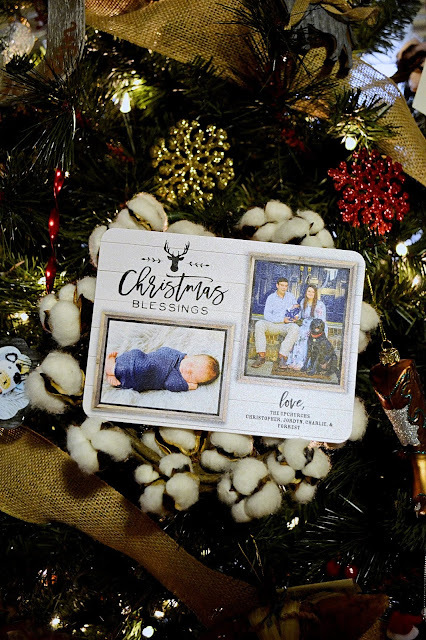 When ordering our Christmas cards, I had a free metal ornament available from Shutterfly and since I was already paying the shipping I decided to do it with Charlie's newborn photo and his name/birth stats on the back. I love how it turned out and even paying full price, it would've been an awesome deal. Definitely worth looking into for keepsakes and gifts in the future. Each year, Chris and I do several ornaments for our tree but we always get personalized ones. 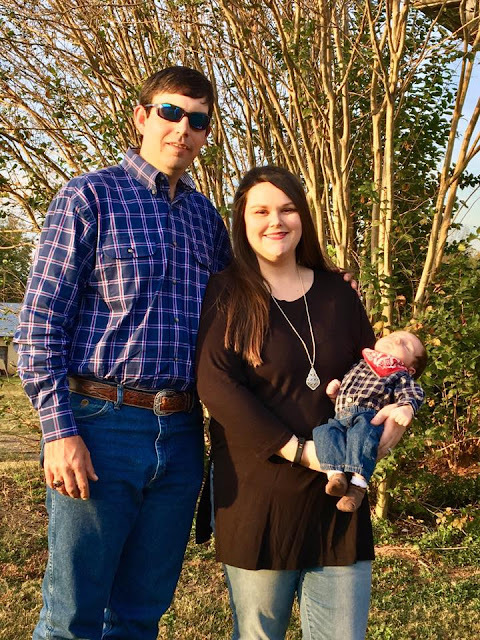 The one above is from our first dating Christmas in 2013 and the one below is our newest, with a new addition-I love that they're the same but with a little baby! 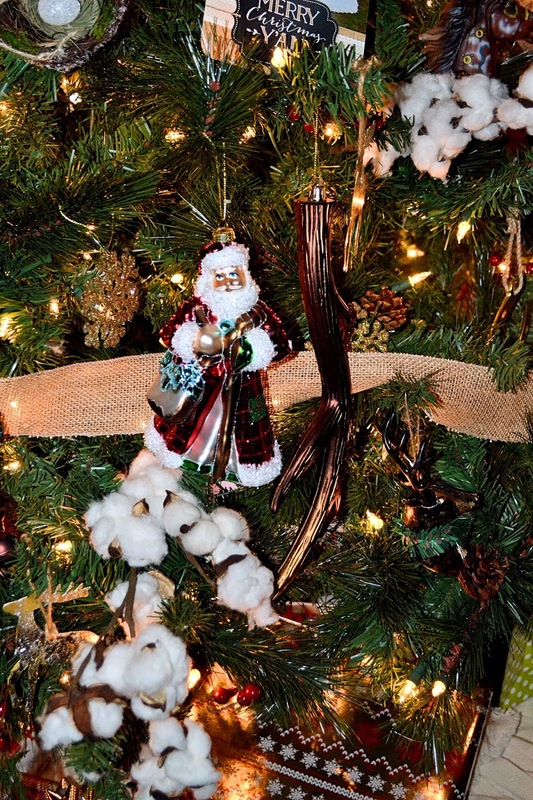 I won't walk you through each ornament, but just a few of the ones we added this year. I picked this little red truck up from the Target dollar spot for $1! Best deal on an ornament that I've bought in a while. 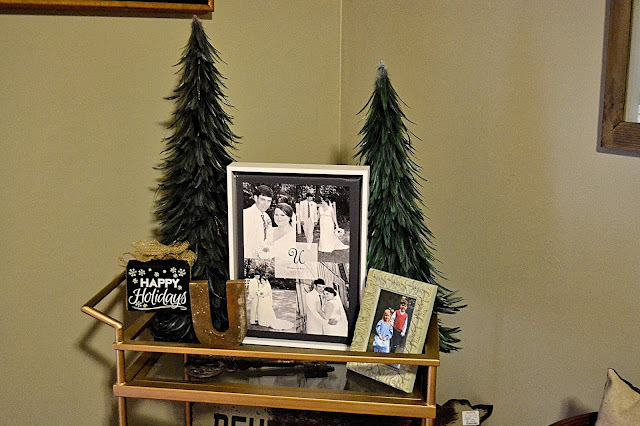 We always display special paper good items on our tree, our wedding invitation & our Christmas cards from years past...this year's was hard to photograph because of the pearlized paper but I love it so much! 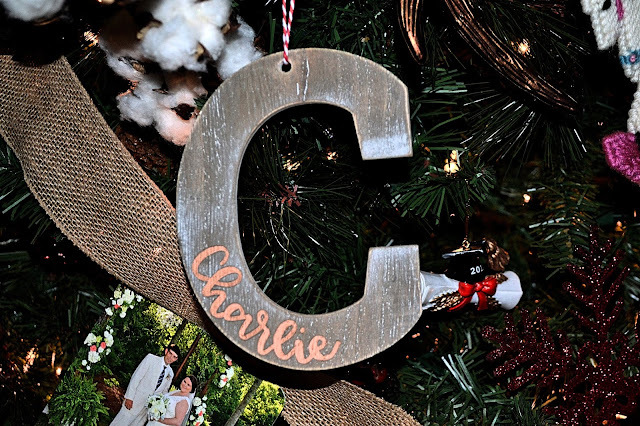 And the rustic letters I found below at the Target dollar spot, I bought 2 C's (for Chris & Charlie) and one J (for me!) 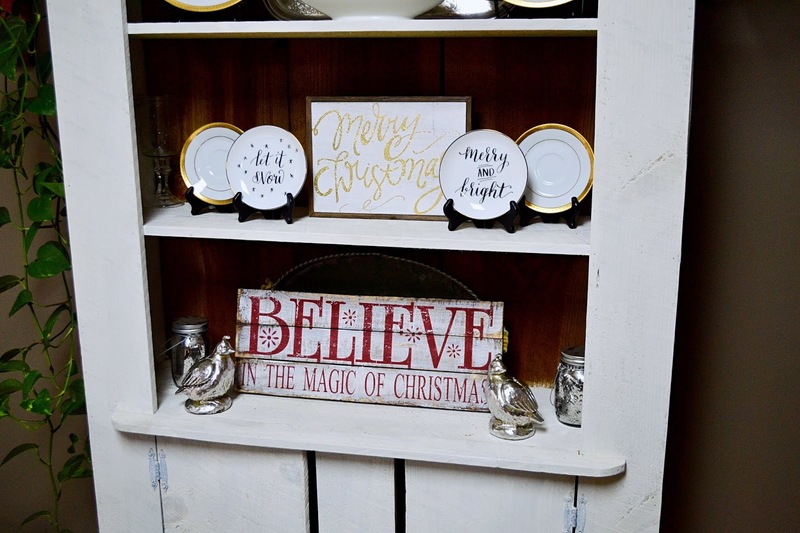 and my oldest sister hand lettered the names on them-I love how they turned out! 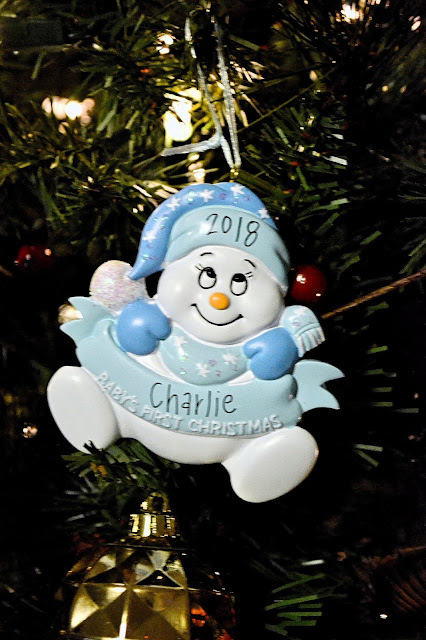 The same sweet mom of one of our friend's came by the other day to start a new tradition for little Charlie. 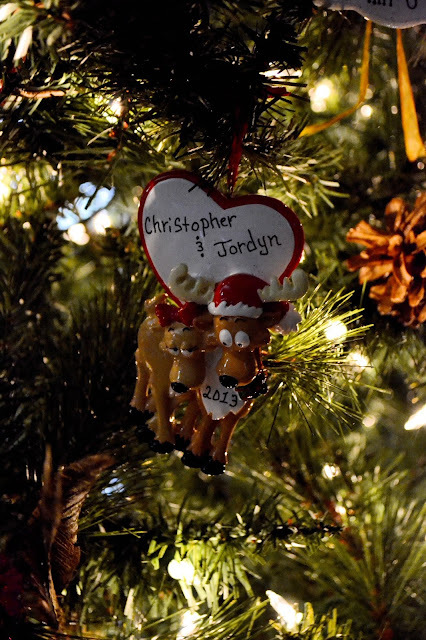 She gifted him a santa ornament to start his ornament collection and it was just beautiful! 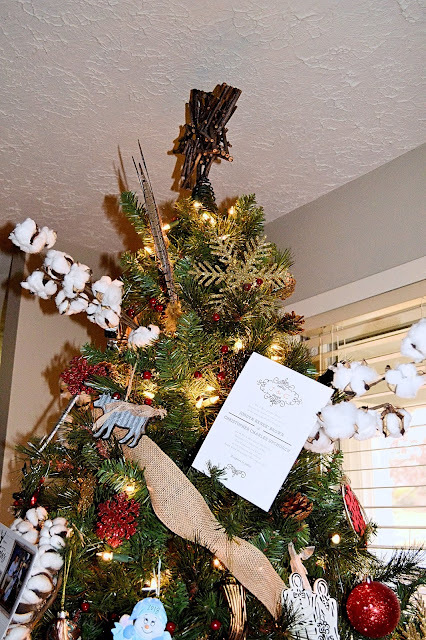 We have a rustic twig star and I added feathers and cotton stalks from our tree, along with burlap ribbon to complete the rustic look. These are the curtains we have in Charlie's room. For as long as I can remember, I wanted my future children to have little trees in their rooms as they grew up-I just think it's so magical! This little five foot tree is from Hobby Lobby and was $40. I raided their mini Christmas tree section for a star that was similar to ours on our big tree and added battery powered fairy lights to make it really glow. 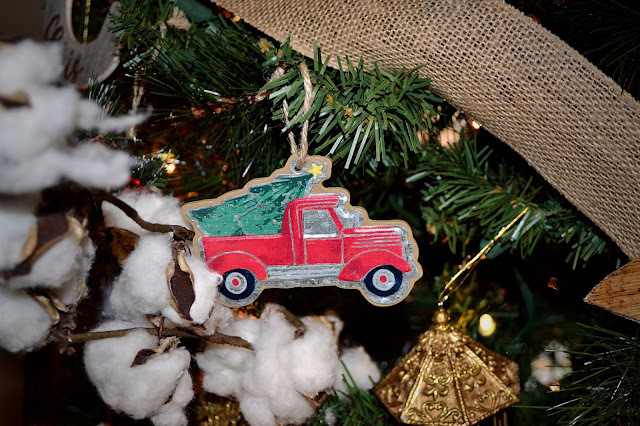 The tin ornaments are strung on a garland (they're farm animals!) and are from Hobby Lobby and the rest of the ornaments are soft ones from the Wondershop at Target and some that I already had. Well, that's it for this year's home tour. . .I'll leave you with the digital rendering of our Christmas cards for this year. 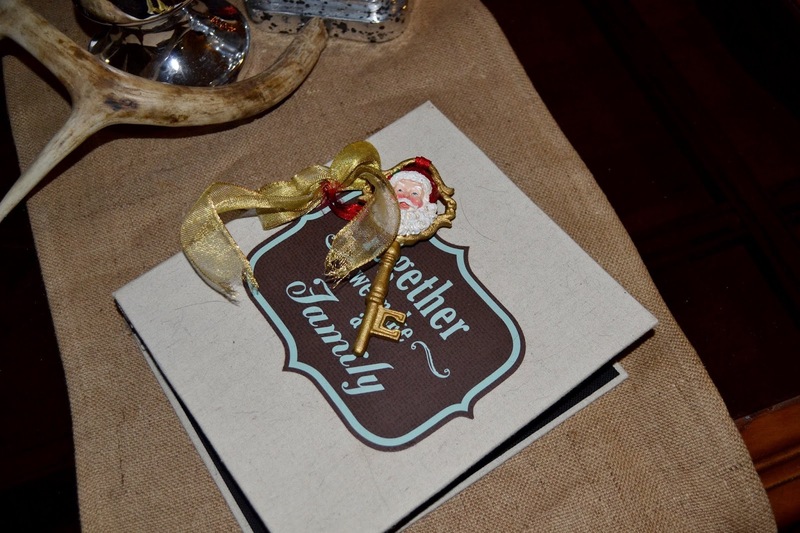 I designed them on Shutterfly and the images are from Amy-Cole Photography!